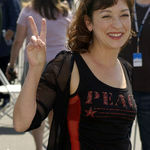 LOS ANGELES (AP) — Elizabeth Pena, the versatile actress who shifted between dramatic roles in such films as "Lone Star" and comedic parts in TV shows like "Modern Family," has died. She was 55. Pena's manager, Gina Rugolo, said Wednesday the Cuban-American actress died Tuesday in Los Angeles of natural causes after a brief illness. No other details were provided. "I am very sorry for the loss of Mrs Pena... She was truly a great actress."